Originally uploaded by Katie M.
Get them at Whole Foods. Normally I consider myself a vegetarian, but these are birds I'd happily eat!!! 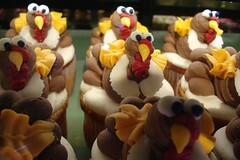 I could gobble, gobble these right up. OMG! I love all these cupcakes! I was proud of my own cupcakes, but these are much better! I wish we had cupcakestores in Holland! Oh my *goodness* these are sooooo fun! I wish I could make something this good!